Join us for an evening of spoken word, poetry, live experimental music and audio visual cut up performances to celebrate William Burroughs’ 100th year, featuring 5 live performances from CP. Lee, Michael Horovitz and Vanessa Vie, Lauren Bolger and David McLean, Ruaridh Law (TVO /Broken20 audio/visual label) and Soft Machines featuring 2 Koi Karp. William S. Burroughs is recognized as one of the most culturally influential writers and visionaries of the 20th Century and his legacy continues to steer world culture and creative thinking. A progenitor of the Beat Generation, his writing and ideas changed literature forever. Burroughs’ multi-media collaborations spawned new directions in film and music and his art is only now being properly discovered and explored. His works come alive in new ways each day and his legacy is constantly evolving. Guerrilla Zoo is proud to announce exclusive access to a unique collection of William S. Burroughs artistic works, curated by James Elphick and Yuri Zupančič. Shepard Fairey, Matt Black (of Coldcut), Cleon Peterson, Ben Frost, Dreamachine installation & more. The Special Collections Library at the University of Delaware is currently presenting a special exhibit in honor of William S. Burroughs’ centenary. This excellent exhibit draws from the library’s extensive holdings of Burroughs, Bowles, and Gysin materials, as well as their collection of underground/little magazines. The library has created a very good website that offers a virtual visit to the exhibit. Go to University of Delaware Library Special Collections and click on current exhibit. 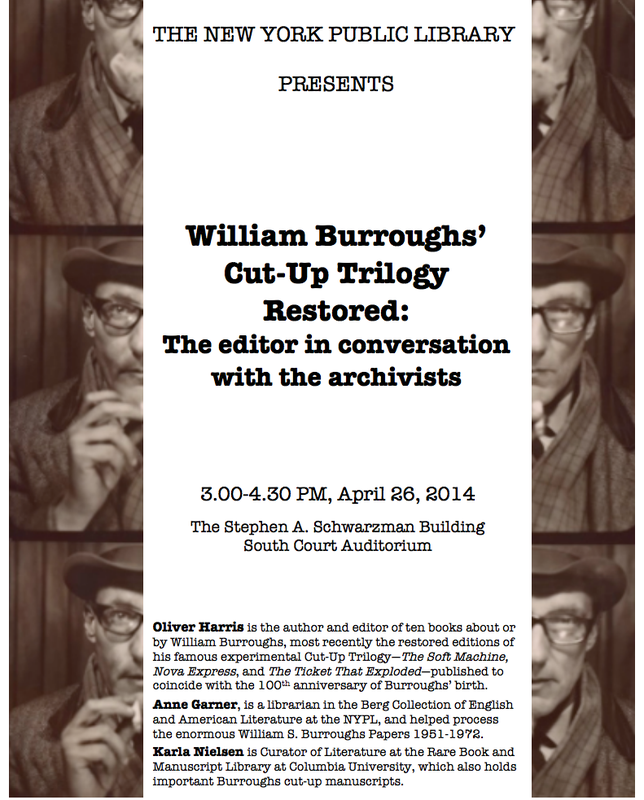 Oliver Harris will be discussing his new Restored editions of Burroughs’ trilogy, The Soft Machine, Nova Express, and The Ticket That Exploded with the archival librarians Anne Garner of the NYPL and Karla Nielsen of Columbia University. At the 59th Annual Conference of the British Association for American Studies, held at Birmingham University, there will be a special EBSN panel, while two more EBSN members—Rona Cran and Melanie Eis—will be presenting papers on another panel that same day. Chad Weidner will give a keynote address at the multidisciplinary “Wood in a Changing Culture” symposium in Fujian province, China on March 21 2014. The World Wood Day Foundation is an international non-profit organization that aims to raise public awareness of wood as an eco-friendly material. Scholars, artists, performers, and fans converged in snowy Bloomington, Indiana, to celebrate the life and work of William S. Burroughs, who would have turned 100 on February 5. The Burroughs Century was organized by our gracious hosts at Indiana University: a week’s worth of events took place both on campus and around Bloomington. It was a multimedia, interdisciplinary affair that included a film series, readings, lectures, performances, and a birthday bash featuring a bug-shaped cake. Materials were on display from the newly acquired Burroughs archive at Florida State University, and the famous On the Road scroll could be seen at IU’s Lilly Library along with other Beat Generation artifacts. A three-day-long symposium brought together Burroughs scholars from around the world. In addition to the panel sessions, there were talks by Jorge Garcia-Robles and Jack Sargent and a keynote address given by Oliver Harris. Events concluded in splendid fashion with a costume party at the Back Door Nightclub in downtown Bloomington, complete with spinning Dreamachines, Burroughs-inspired cocktails, a performance by Davis Schneiderman, and a midnight séance. I’ll leave it up to others to decide whether Burroughs was contacted or not, but the author’s centennial celebration—its organizers, participants, and attendees—was proof that his legacy is alive and well in the twenty-first century. Iggy Pop reflects on Burroughs’ extraordinary life with close friends and artists that felt his influence. Contributors include James Grauerholz, Will Self, Victor Bockris, Jean-Jacques Lebel, Genesis P-Orridge and John Waters. This conference Beyond the Cut-up: William S. Burroughs and the Image will explore new theoretical interventions and accounts of Burroughs’s ideas of the image, its effects and modes of operation, its impact on human consciousness, its complex embedding within textual and other fields, its psychological and ideological transformations of perception. Hi, I would love to send a CFP to your website for our upcoming event “The Burroughs Century,” from February 5-9, 2014 in Bloomington, IN, USA. We are in discussions with Oliver Harris to be our keynote speaker, and want to open it up to any and all scholars in your network who might be interested in coming to our festival to honor Burroughs’s legacy on what would be his 100th birthday. Please send me your contact email when you get a chance.